a non-partisan, location-independent organization aiming to kickstart a debate around the question: What’s the purpose of education? With a 3-year plan, a series of campaigns, and a weekly newsletter we aim to empower people to get involved and make a difference in their neighbourhood, area and country. As can be seen from the list of blog posts, participants at the event seemed to find it stimulating. The context to the day was summarised by Josie Fraser, chair of the event who described how she “spent Saturday 30 April in Sheffield, at the Purpos/ed Summit for Investigators, along with 50 delegates from across the UK who had given up their Saturday to take part in a day of discussion and action planning aroundPurpos/ed. Julia Skinner invited readers to “Picture a group of like-minded folk, a state-of-the-art university and cupcakes and you have a recipe for a great afternoon of discussion and debate” whilst Doug Belshaw, one of the co-facilitators described “yesterday [as] one of the best days of my life“. I’ve spend a week reflecting on the event. Whilst I too found enjoyed meeting like-minded people and was pleased that the event was so well organised, I couldn’t help but feel that the enthusiasm for engaging in a debate on how education can be reshaped was, perhaps, somewhat misplaced. In my 3 minute talk on Education: Addressing the gaps between the fun and the anxieties I suggested that there will always be a need to be anxious about education and that such anxieties will not only be felt by learners but also those who are engaging in learning processes, including teachers, academics, learning support staff and learning organisations themselves. Yesterday I came across a tweet which provided a link to a discussion on “Massively Open Online Courses – the Death of Universities?“. The title of the discussion reminded me that the Purpos/ed meeting was held at the Conference 21 venue, which overlooks Park Hill Flats. I was told that this is the largest listed building in Europe – and the Wikipedia entry confirms this. Park Hill Flats are, however, currently empty. Wikipedia describes how “Although initially popular and successful, over time the fabric of the building has decayed somewhat“. I couldn’t help but wonder whether we may see a similar fate for large buildings to be found in many University campuses. We have seen investment in higher education during the Labour Government which has some parallels with the investment in public housing in the 1950s and 60s. However the approaches taken to providing homes weren’t sustainable and whether due to a lack of further investment to support maintenance or the occupants’ preference for an alternative living environment, we found that such large council housing estates were either demolished (such as Quarry Hill Flats in Leeds) or mothballed, awaiting further investment as is the case in Sheffield. Dave Kernohan has contributed to the discussion on Massively Open Online Courses (MOOCs) by arguing that traditional Higher Education models are under attack from two sides: the government cutbacks which we will all be familiar with and, in addition, the views that independent learners are well-positioned to exploit the availability of open educational resources and the wide range of freely available online tools which are also now available which can be effective in supporting one’s personal learning network. 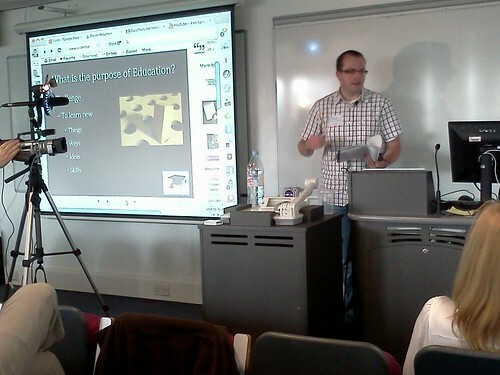 Dave Kernohan suggested that “we are also seeing an attack based on stuff like Anya Kamenatz’ idea of a DIY U (http://www.diyu.com) ” – this echoes my “Dazed and Confused After #CETIS10” post in which I also suggested that the “case for radical innovation” associated with the DIY University could result in the dismantling of high educational institutions, rather than reforms and improvements which many of those working in education may be seeking. If the future of education does lie in Massively Open Online Courses it seems to me there will be many empty buildings on campuses. Perhaps every University town will be competing to boast that it has the largest listed building in the country? Of course this won’t happen (just as the developers of the high rise buildings knew that their work would also have a long-lasting impact:-) But I do think that the debate of the Purpose of Education does need to address the negative implications of ideas for the future. This entry was posted on 7 May 2011 at 1:00 pm	and is filed under Web2.0. You can follow any responses to this entry through the RSS 2.0 feed. You can leave a response, or trackback from your own site.